This week we invited Ron Mitchell from Mitchell Media to talk to our students who will be using the Xerte Online Toolkit as part of the their Health Psychology module. I thought it was a very useful session because Ron did not focus on the technicalities of using Xerte but on ways of working and on complimentary skills and applications that make using XOT more effective. As he put it, using Xerte is the easy part, it’s just like filling in any online form, like buying anything online. Being imaginative and planning to achieve pre-determined goals and objectives is the difficult bit. Here are my notes from Ron’s session. These are a combination of notes to myself and things students may need. Ron used them with short urls but I had the impression not many students knew how to use them. Certainly I didn’t see anyone scan a code with their phone. Now admittedly the students were working on desktop PCs but I would have thought someone would have scanned and emailed themselves the link. So here’s all you need to know about QR codes – to make your own QR code, google “QR code generator” and you’ll find lots of free generators. 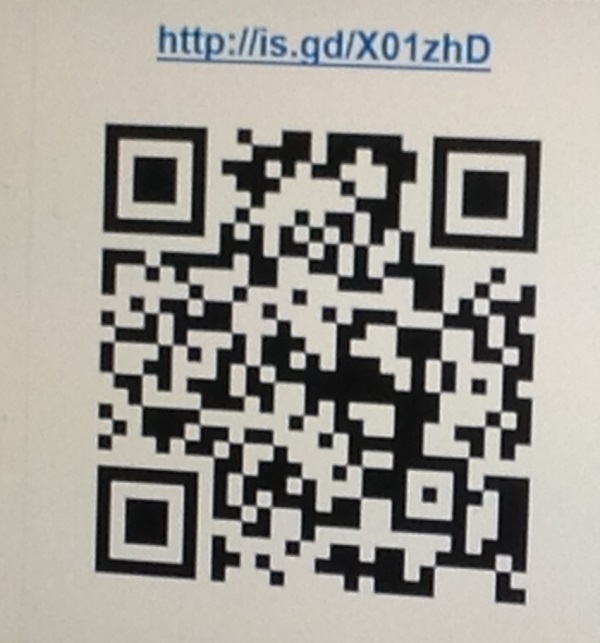 All you do is type in a url (web address) and it generates an image (QR code). To get a free app on your phone so that you can scan a code and be taken to the website associated with it, go to the place where you get apps and search for “QR scanner”. Ron used a code that took you to a Google Document. This was to collect information from the students. I had the impression that Google Drive was something new to most students. Being able to create a collaborative space on the web which people can edit simultaneously is very useful and could be used effectively by tutors and students on this module. This link explains a bit more about Google Apps – http://youtu.be/doHnLiAzQ5M. There’s a link to Google Drive on the top of any Google Search page. This is the search Tool we used for finding images which we could use under Creative Commons licence in our Xerte projects. Xpert not only finds the image but stamps on to it the attribution required to avoid being accused of plagiarism or breaking copyright. The url = http://www.nottingham.ac.uk/xpert/ When you find the image you want you click the image and can choose to “get image with attribution (Xerte On-Line Toolkits size). Xpert can search for much more than images – Very useful! This was mentioned. It allows Xerte to run on mobile devices but IMO if you are student on this module, you can forget it as the latest version of XOT creates learning objects that run on mobile devices. Apparently a common question is how can existing Word documents and Powerpoints be used in Xerte? The answer is that ideally you should remake them in Xerte. However, if it makes sense to keep them in Office format for some reason, you can link to them. You can use image types – png, gif and jpg but not bmp files. I wouldn’t worry too much about this but be aware that bmp files won’t work. So if you add an image and something goes wrong, suspect that its file extension is bmp. Normally, web images and images you will create with your phones/cameras will be fine. Digital cameras produce huge images that take time to download/view especially on 3G or wifi and the fact that they have millions of pixels and could be blown up to poster size does not improve the viewing quality on a laptop or smaller device. A standard desktop’s screen is only 1024 x 768 pixels so you should resize large images to this size (or smaller). Ron suggested resizing in Powerpoint. You do the resizing there and then save the image. if you don’t understand, go to youtube and search for “how to resize images in Powerpoint”. You can also use a free program like pixresizer or a free online service. There are many out there, just search for “free online image resizer”. If you want to make an image the correct size for the xerte ‘workspace’, you can use PowerPoint. Create a custom size slide of 800 x 514 and assemble the elements you require onto it – text boxes, images etc. Then save as an image and add it to Xerte. It’s a good strategy to include audio for users who prefer it and for those who need it instead of text. Audacity (a free program) allows you to edit. Audacity is on the Newman network. Ideally upload it to youtube or vimeo or a similar video sharing service rather than upload to Xerte. This allows the video to stream down to the end user’s device. mp4 is the ideal format. Ron recommended Format Factory as good conversion software. personally, I use Handbrake. On Newman PCs we have video editing software called Video PAd. This can be downloaded for free for home use. Video Pad. Why you might have duplicate projects in your Xerte? Ron observed that when you create a new project in Xerte, in some browsers there is a pop up message at the bottom of the screen that disappears after a while. Some students miss seeing that message and think nothing has happened and so create the project again (and again). You can delete these emply projects. Please try to be aware of any pop up messages that might appear, especially if nothing seems to be happening. 1. standalone pages eg text page. Whatever you do, you should save regularly. Other pages too in most cases. Be driven by your own imagination and objectives and your storyboard, not by the format of the templates. Don’t use all the templates! Just because you have a huge choice shouldn’t mean that you use a confusingly large number of different screen designs. Plan ahead in another tool… you can storyboard in PowerPoint. Ron provided a xerte storyboard template. Groups agree a common design for the learning object and each member is assigned a part. The part may comprise any number of Xerte pages. When finished the student shares the pages they have done with their team members. Then all team members assemble the pages into their own LO (learning object). This would allow each student to submit a LO on which they had collaborated. Ron recommended stipcreator.com for making comic strips. Remember too that you can do a lot of editing on youtube itself, e.g. add captions, animations, narrations etc. H also uses animations of a hand writing on a white board and placing pieces of paper. These were created with Videoscribe. See – http://youtu.be/tmDo3FLSNig but this is not a free product. You can create similar effects without buying the product – see http://youtu.be/YxW5FfuFyvc, but I think you could get caught up in spending hours on making eye candy and lose the whole point of the project – to create something that is effective and easy to understand in a limited amount of time. Students on PY631 should remember just what they will be assessed on. By all means experiment with these tools but you do not need to use them to pass this module. 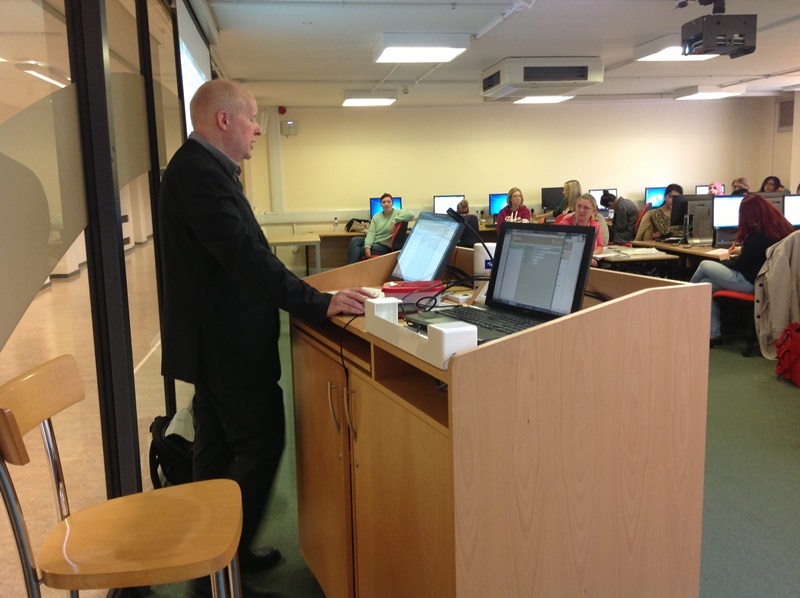 Ron also supplied lots of guides and examples and these have been distributed to students via their Moodle course. One of the aims of this project is to increase the digital literacies of students and staff. We’re only in week two but if we engage with this little lot, think of how much more digitally fluent we will be by the end!